This classic Casio digital men's watch features a resin case and strap with calendar, LCD display, light, dual time, stopwatch, daily alarm and is water resistant to 100m. This watch makes a great present, or treat for yourself. 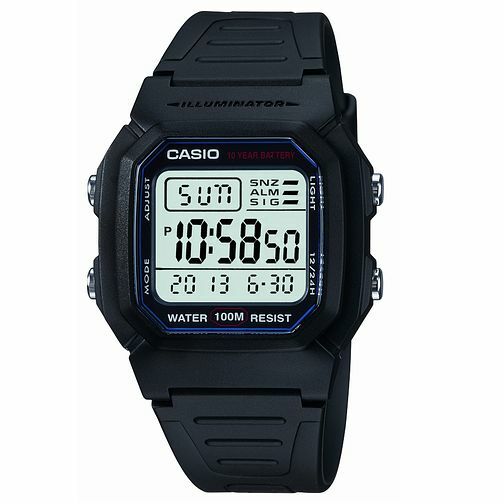 Casio Men's Black Resin Strap Digital Watch is rated 5.0 out of 5 by 3. Rated 5 out of 5 by Anonymous from A bit of Retro Nostalgia FAB for Dog Walking! If like me you love a bit of retro nostalgia (oh if only I had a time machine!) then I highly recommend you treat yourself and buy this old skool Casio watch - ITS FANTASTIC! Such a bargain price and you get so much for your money. It has a comfortable rubber strap, the day and date, time, its water resistant, has an alarm, stop watch etc on it, as well as a light! Seriously what more could you need in a watch? I personally bought this because when i'm walking the dog in the early mornings and its pitch black and freezing cold i'm too scared to get my iPhone out to check the time in case i drop it (ha ha). I love anything 80s & 90s so decided to search for a retro style Casio watch and came across this one. Highly recommend it and the ordering and delivery process was all very smooth.